Henry Shoemaker Conard (1874 - 1971) was a native of Pennsylvania who earned his B.S. and M.A. degrees at Haverford College and a Ph.D. at the University of Pennsylvania. As a Senior Harrison Fellow in Botany at the University of Pennsylvania, four years of study led to the publication of his landmark monograph on the genus Nymphaea, The Waterlilies, by The Carnegie Institution of Washington in 1905. In 1906 Conard joined the faculty of Grinnell College in Iowa as professor of botany. There he gained international recognition as an authority on mosses and waterlilies. He was honored by the Botanical Society of America on its 50th anniversary as a "taxonomist, morphologist, mycologist, ecologist, bryologist...and above all a beloved teacher." 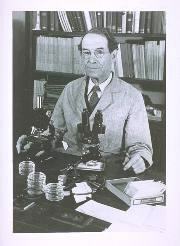 He retired to Florida in 1944, where he continued his research and publishing until his death in 1971 at 97.